As an arranger, accompanist, composer, and music director, Julian’s work is broad and varied. 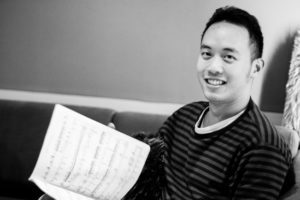 Julian is the arranger and music director of Spotlight Singapore in Mexico City 2015, ChildAid 2014 & 2016, Goh Lay Kuan’s Returning (Singapore International Festival of Arts 2015), Mark Chan’s Flight of the Jade Bird (Hong Kong New Vision Arts Festival 2012); Lao Jiu The Musical, If There’re Seasons, Liao Zhai Rocks (The Theatre Practice); Jason Robert Brown’s The Last Five Years (Dream Academy), amongst many others. He has served as accompanist to Ramli Sarip, Art Fazil, and Kit Chan (Spellbound Concert Tour 2015-16). Selected composing credits include the Marina Bay Singapore Countdown firework displays 2014/15 and 2015/16; The wee Question Mark and the Adventurer and Kuo Pao Kun’s Day I Met The Prince (The Theatre Practice); The Emperor’s New Clothes and Own Time Own Target (W!LD Rice); The Boy Who Cried Wolf and The Ant and the Grasshopper (I Theatre); Tropicana (Spare Room Productions); Actor 40 (The Necessary Stage). As a guest arranger and conductor, Julian has worked with Joyful Strings, Ministry of Bellz, Rave Harpers, Orchestra of the Music Makers, and Metropolitan Festival Orchestra. Julian Wong has written many ensemble music for Rave Harps Ensemble and is Music Director and Composer to the new musical this year “Legends of the Harp”.